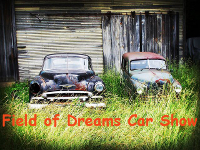 Please download & complete the show car registration form and email the completed form to fieldofdreamscarshow@gmail.com subject=Show Car Registration Question, if you wish to show your vehicle at the show Sat. & Sun., November 23rd & 24th, 2019. Gate opens at 8am both days. Judging is on Saturday and Sunday and trophies will be done on Sunday. Any questions regarding this form please call 813-956-3503 or email at fieldofdreamscarshow@gmail.com subject=Show Car Registration Question. NOTE: This show is open to all street rods, rat rods, customs, show quality pickups, 4 wheel drives, jeeps and special interest vehicles; including modern muscle/performance cars. (CASH ONLY AT GATE) Fee covers up to four (4) people per vehicle for both days.